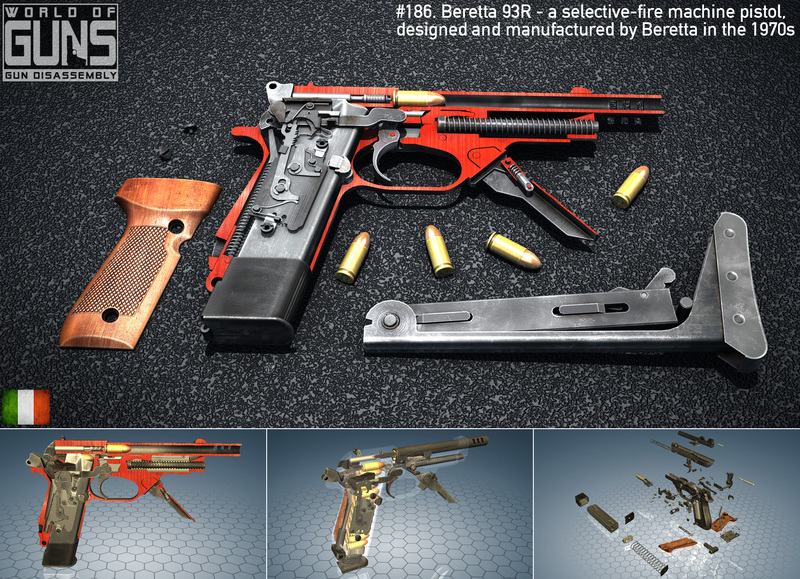 The Beretta 93R is a selective-fire machine pistol, designed and manufactured by Italian firearms manufacturer Beretta in the 1970s for police and military use, that is derived from their semi-automatic Beretta 92. The Galil is a family of Israeli small arms designed by Yisrael Galil and Yaacov Lior in the late 1960s and produced by Israel Military Industries Ltd (now Israel Weapon Industries Ltd) of Ramat HaSharon. 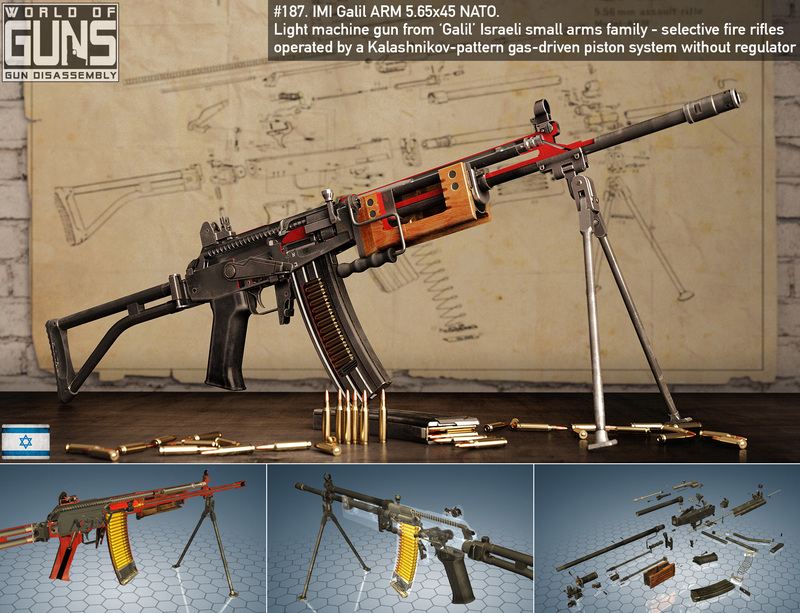 The rifle design borrows heavily from the RK-62 and has a modified gas diversion system similar to the RK-62 to reduce the recoil of the rifle making it easier to fire especially in automatic mode. The weapon system consists of a line chambered for the intermediate 5.56×45mm NATO caliber with either the M193 or SS109 ball cartridge and several models designed for use with the 7.62×51mm NATO rifle round. It is named after one of its inventors, Yisrael Galil. The Galil series of weapons is in use with military and police forces in over 25 countries. 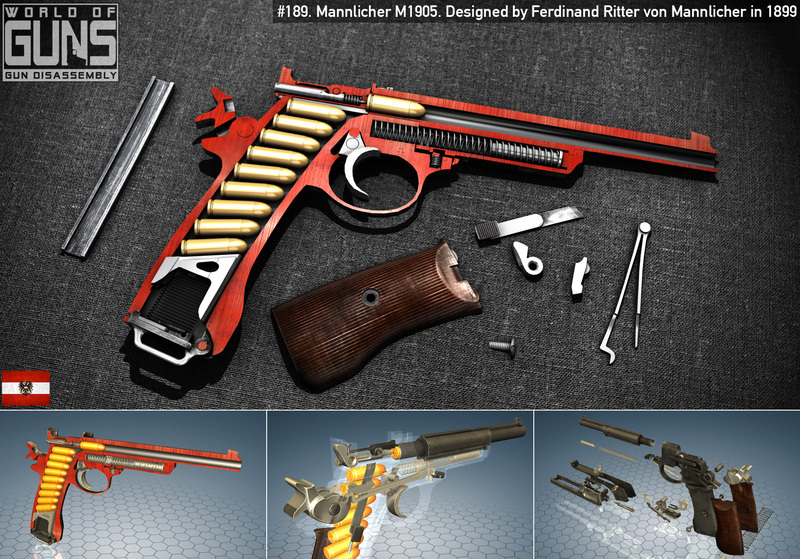 The Modelo 1905 is a pistol designed by Ferdinand Ritter von Mannlicher in 1899 and originally produced in Austria as the Mannlicher Model 1901. The Mannlicher Model 1901 was an improved version of the Model 1900, both of which were produced by Osterreichische Waffenfabrik Steyr (commonly known as Steyr). All of these models have the same basic design and operation, but minimal adjustments were made to improve each of them. The Modelo 1905 is the version of the Model 1901 that the Argentine Army purchased from Steyr in 1905. This semi-automatic pistol has a unique and elegant appearance due to the curve of the handgrip. It is single action and uses a blowback operation system to reload. Like its predecessors, the Modelo 1905 has a non-detachable magazine that can be loaded from the top with a stripper clip. #190. 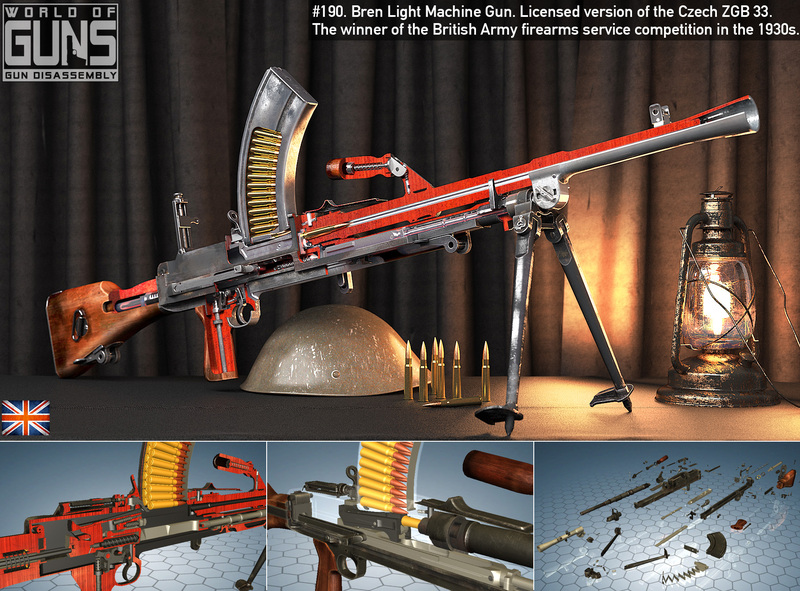 Bren light machine gun. 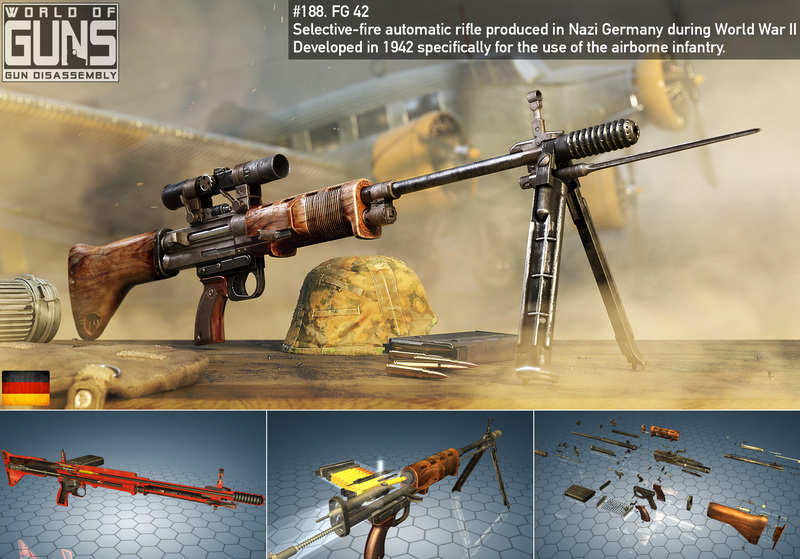 The Bren gun, usually called simply the Bren, was a series of light machine guns (LMG) made by Britain in the 1930s and used in various roles until 1992. 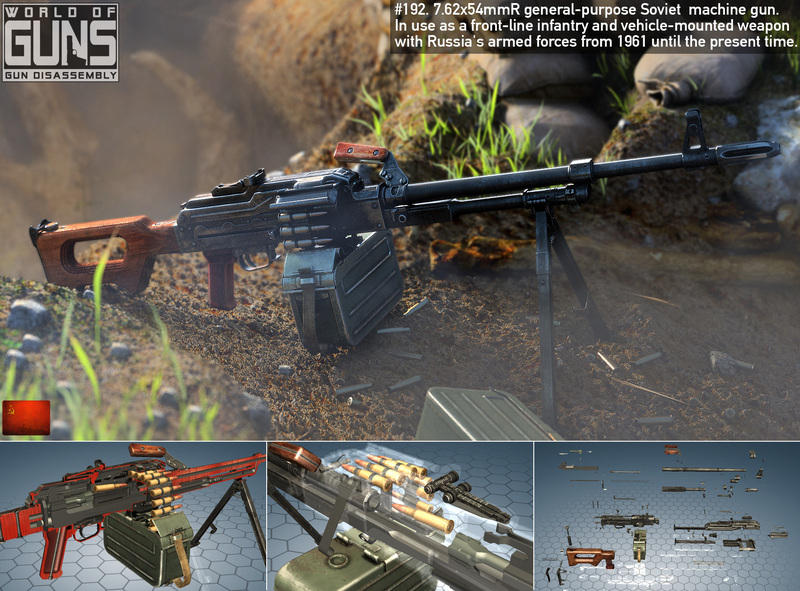 While best known for its role as the British and Commonwealth forces' primary infantry LMG in World War II, it was also used in the Korean War and saw service throughout the latter half of the 20th century, including the 1982 Falklands War. Although fitted with a bipod, it could also be mounted on a tripod or vehicle-mounted. The Madsen was a light machine gun that Julius A. Rasmussen and Theodor Schoubue designed and proposed for adoption by Colonel Vilhelm Herman Oluf Madsen, the Danish Minister of War, and that the Danish Army adopted in 1902. 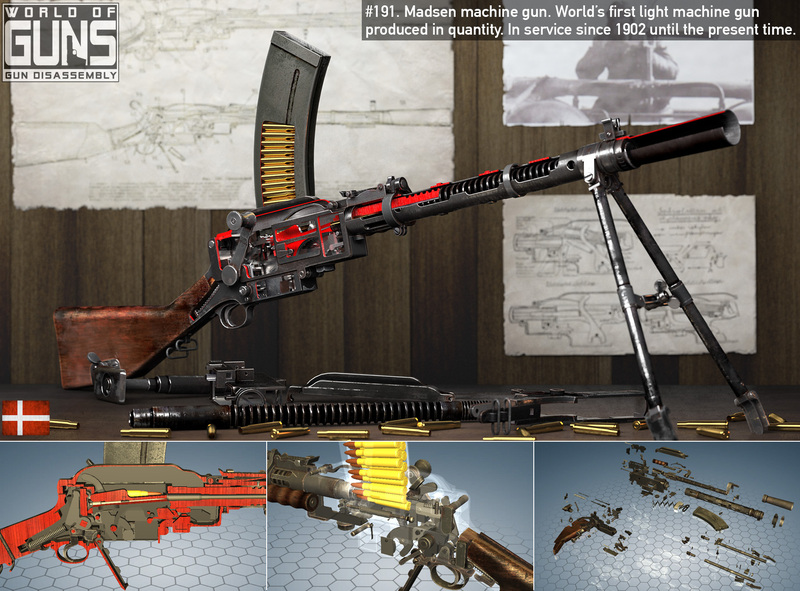 It was the world's first true light machine gun produced in quantity. Consequently, Madsen was able to sell it in 12 different calibres to over 34 different countries worldwide, where it saw extensive combat for over 100 years. The Madsen was produced by Compagnie Madsen A/S (later operating as Dansk Rekyl Riffel Syndikat A/S and then Dansk Industri Syndikat A/S).